This page is about the French utility helicopter IAR 316B. For other uses, see Alouette (Family). 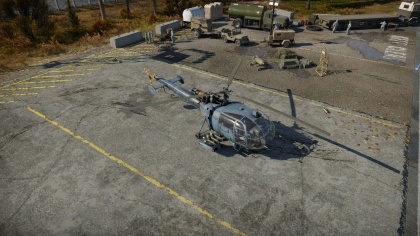 The IAR 316B is a Rank V French utility helicopter with a battle rating of 9.3 (AB/RB/SB). Aérospatiale licensed to the Romanian aircraft manufacture Industria Aeronautică Româniă to build the SA.316B as the IAR 316B. Manufacturing began in 1971 in Brasov, Romania, with production ending in 1987. These helicopters were built with the Turbomeca Artouste IIIB powerplant. 250 total units were manufactured with 125 remaining for use in with the Romanian military. The rest of the manufactured helicopters were exported to other nations which include Pakistan, Angola and Guinea. The cockpit of the helicopter is built for both a pilot and co-pilot to operate with excellent views through the spacious glass canopy. Two cabin doors open to the passenger compartment which can accommodate up to three passengers. 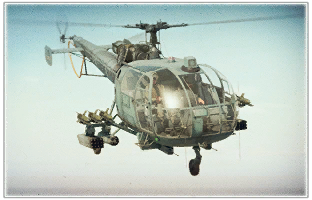 The IAR 316B was modified to carry weapon systems more readily available in the Eastern-bloc section of Europe to include 57 mm rocket pods, 7.62 mm machine guns and other anti-tank missiles. This page was last edited on 1 April 2019, at 16:27.